I was going through the store when a fuzzy little dog barked at me. It really caught me by surprised and I kneeled to look more closely at the Furreal puppy. The Furreal Friends pets are great idea. 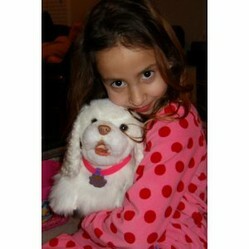 After all, what kid doesn't want a fuzzy pet of their own. Unfortunately, most pets are too time consuming and expensive to be enjoyed, and a lot of parents find that having a real, live pet is too complicated for most young children. Hasbro helps create a nice little compromise where the kids can have their pet and the parents don't have to clean up any poo -- and the landlord has no say in the matter! 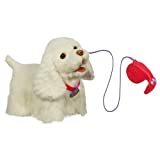 The Furreal Friends line of pets are all a lot of fun, but the “GoGo My Walking Pup” is a really fun change to the Furreal Friends lineup and takes the pet to a whole new level of interactivity. To begin with, this Walking Pup has all of the fun attributes which makes the whole Furreal friends line so endearing. Probably one of the neatest things about the Walking Pup is how it senses its environment and interacts with it. Even in “sleep mode” it will bark and try to get your attention, enticing you to play with it. Like the other Furreal puppies, this one barks, wags it tail, and snuggles with its owner. You can spend hours interacting with it, combing its hair and loving on it. Dress it up, take it to tea-time, this dog likes going where you go. Even for kids in the 3-5 year old range, this puppy is perfect as the remote is pretty easy to understand and figure out. It is important to realize that this GoGo Walking puppy has a hard body (it is a robot, after all). I only say that so you don't expect an overly-plush animal. What really makes the GoGo My Walking Dog different from the other Furreal puppies out there is that you can actually take it on a walk. 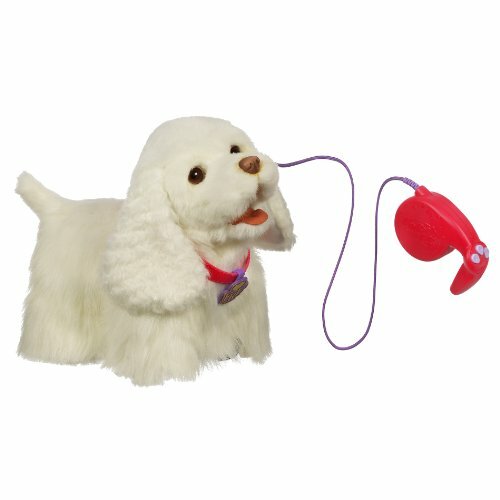 It's little wheels roll along and respond to commands from your leash remote. It really gives the child more of the feel of having some of the responsibilities of true dog ownership. The leash also detaches, allowing the kid to separate their walking time from other play times. Having a removable leash really expands the range of playability for this puppy. Some people have said that this dog seems to really be nothing more than a "remote control car for girls", and maybe their right. It incorporates the fun control of a remote control car with the love and affection of a doll. Boys may like this toy as well, so each parent will want to just consider their child's taste to make sure its a good match. Especially if you can teach your kid to comb its fur and keep it clean, it should look good for quite some time to come. Requires 4 "C" Batteries. No dog food required. It has a lot of sensors and goes through a lot of batteries, so you may want to grab some rechargeable batteries or one of those bulk boxes of batteries on Amazon. This toy has been out since 2010, but it continues to be one of the hottest FurReal pets available. You can be sure that your choice to buy a FurReal GoGo My Walking Dog for that child in your life will be met with a lot of happiness. As with all collectibles when collecting Ty Beanie Babies there are a few important tips to keep in mind. Knowing these tips may increase the value of your Beanie baby collection. The Steiff Panda is the sweetest black and white plush bear you'll ever get your paws on and makes a precious, lasting and high quality Steiff gift for panda collectors and kids.